Small studios making big plays. I remember the first time I played Dota 2—also the first time I'd played a MOBA—having just come off a years-long MMO PVP habit. Only, four abilities? I thought, thinking of screen-spanning hotbars packed with powers and items. This is easy. Four years later I no longer play MMOs and Dota 2 is a regular part of my life. I've become much more sensitive to the complexity that can be packed away in a few active powers, able to appreciate the complicated dance of decisions that makes the difference between a fight won and a fight lost. There's drama in cooldown timers, plays and counterplays. Battlerite is all about that drama. It's a spiritual successor to Bloodline Champions, but if you didn't play that game (and I didn't) then it's best understood as MMO arena combat executed with a good MOBA's design finesse, a kinetic game of careful ability management within an elimination framework. The last team standing wins the round, and the winner of three rounds takes the match. It's such a simple idea, and I came to it expecting a stripped-back version of Dota: a sort of 'just add water' teamfight solution, something I could dip into when I didn't want to worry about map strategy but that probably wouldn't hold my attention for very long. Wrong again. Battlerite is an extraordinarily well-designed game, and digging into each of its heroes reveals a skill ceiling that I can just barely glimpse from my position down here in the trenches. Where once I looked at a MOBA's compressed action bar and thought 'easy', now I'm looking at six abilities and their EX variants plus bespoke conditional effects and seeing the long road to mastery stretch out in front of me. It's much more than I bargained for. More than just a pocket-sized teamfight generator, Battlerite reliably hits a sweet spot that you only encounter every now and then in other games, where players on both teams have just enough levels and items to allow for meaningful play and counterplay. Combos mean something very different in a isometric game of action bar combat, but the essence, the visibility of talent, is there. If I had to explain it to a Dota player, I'd put it this way: you know those moments when you're under attack, but you know that there's a chance to outplay your opponent if you do everything right? That you can lose them in the trees just so, manipulate line of sight just so, nail that one skillshot, buy yourself time to get that one crucial ability off cooldown? That's Battlerite pretty much all of the time, and it's awesome. Yet Dota is only a useful comparison up to a point. This isn't really a strategy game, crucially, and every player earns power at the same rate. The other game I'm reminded of is, strangely, Street Fighter. That's down to the skill cap—there's something about watching a player who really understands a particular character that reminds me of people who have complete mastery over their fighting game main. Combos mean something very different in a isometric game of action bar combat, but the essence, the visibility of talent, is there. I'd thoroughly recommend it to anybody who enjoys this kind of combat in other contexts, whether your regular poison is Dota 2 or Smite or League of Legends. It's even, arguably, a good way to introduce this passion to your friends who've never 'got' it: rounds are short and exciting, and if you avoid using the 'M' word then you could probably convince a MOBA-averse gaming pal that they're actually playing an isometric action game. The only downside I've encountered so far is (as ever) the in-game community: there's a reason that Battlerite's chat function is disabled by default. I recommend leaving it that way. This is a good game, but it's not good enough to fix people. 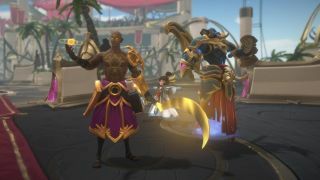 Battlerite is a very pleasant surprise: a quality early access game at a bargain price point that meaningfully fits into one of the most hotly contested design spaces in online gaming. I'm struck by how much the developers have got right, particularly for a first release. It could be light on characters and environments but it isnt, offering plenty of heroes to try out of the gate and an impressive array of arenas each with their own character. After a week of Fractured Space and fresh off a Duelyst kick, Battlerite confirms the importance of independent studios in what was previously a part of gaming dominated by the big dogs. We're entering a golden age of lightweight, well-designed online competitive games and, if you've been buried in the same handful of genre-leaders for the last couple of years, it's time to start exploring.